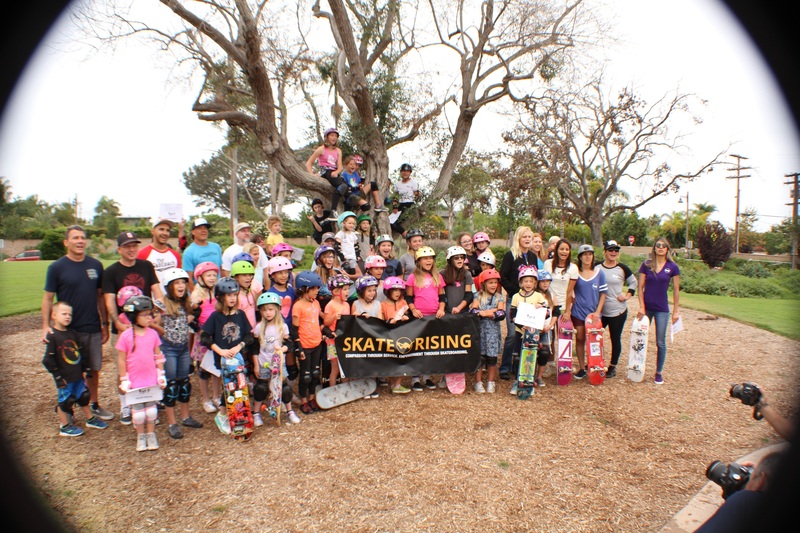 Skate Rising brought girls around the globe together to have fun skateboarding and give back to their community. and skateboard with friends new & old. 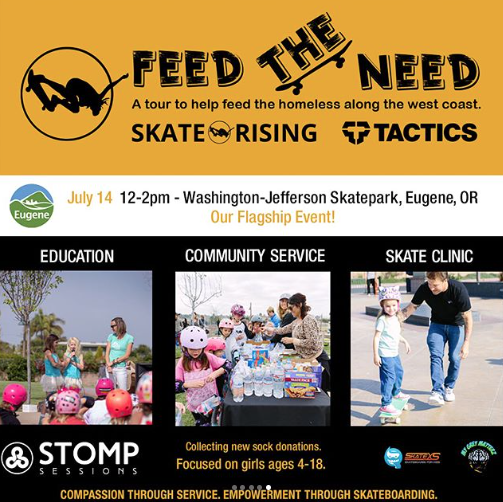 The Eugene, Oregon stop was the final stop in the Skate Rising Feed the Need Tour presented by Tactics. For recap on stops along the California coast leading up to Eugene click. July 14th, Tactics Eugene donated 10% off all sales to the River House’s Skateboard Program. 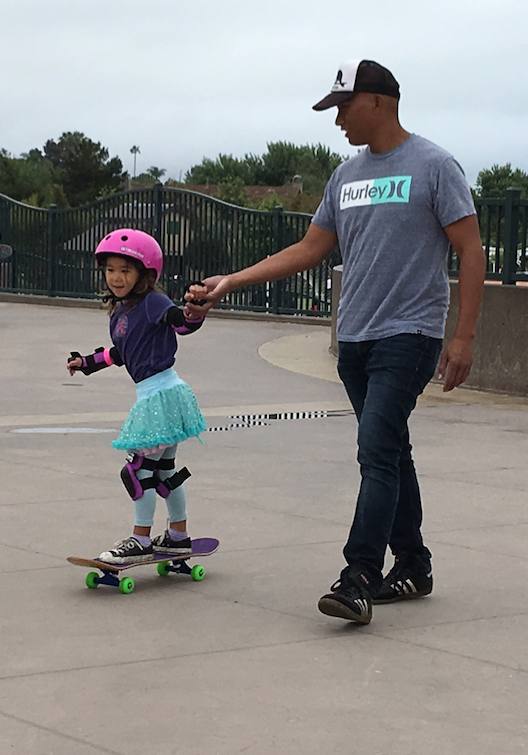 Yup, 10% of every deck, t-shirt, hat or anything else you could think of is going straight to helping kids learn how to skateboard! A huge thank you to them and all the people/organizations who are of service on July 14th and every day. 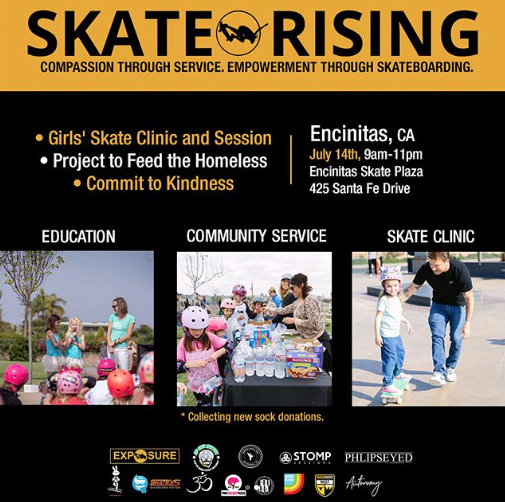 I love volunteering at Skate Rising because for me it’s a way to pay it forward for what I’ve been given. 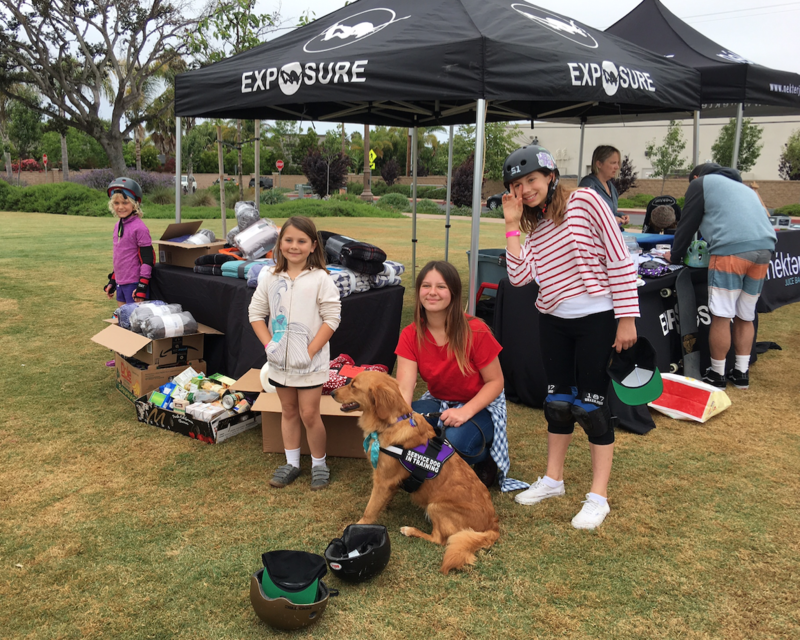 I still learn so much on and off the board from Neal Mims and Calli Kelsay, plus I’m thankful for Amelia Brodka and Lesli Cohen for founding EXPOSURE Skate which started all these events. Here’s just some of the thoughts on Skate Rising from attendees. 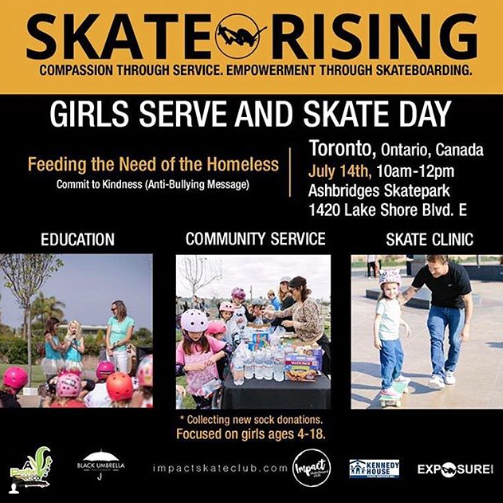 Awesome morning with @impactskateclub & @skaterising in support of @kennedyhouseyouthshelter. Best people. The #twinjas loved it. 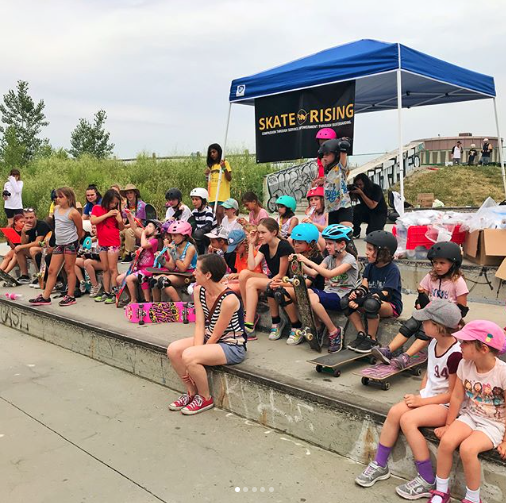 We had a great time in Toronto supporting @impactskateclub and @skaterising for their international day of service where we set up kits for the homeless and had an awesome girls skate clinic! Thanks for having us be a part! Wow! 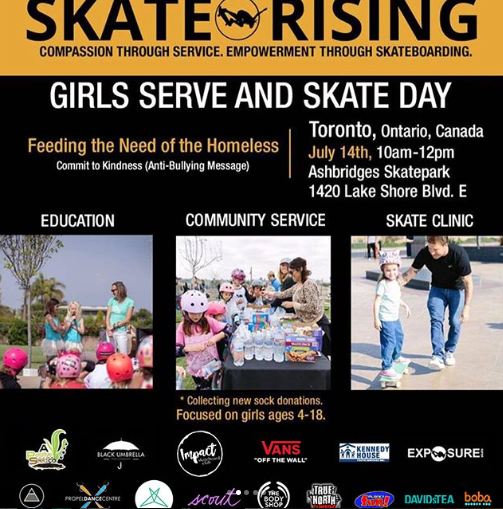 What a great day at Toronto’s Skate Rising International Day of Service! 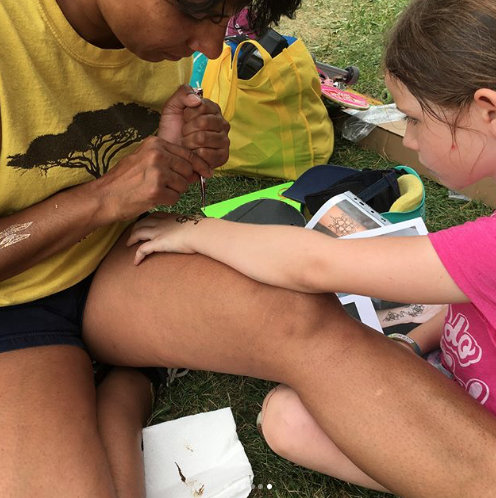 It was a privilege to henna the arms of some pretty awesome girls as they learned the value of community service. 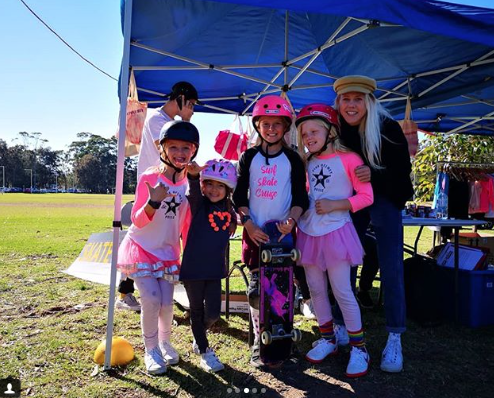 What an amazing day, thanks so much @skaterising for having us and thank you to all the amazing young girls who are pathing the way for change. A truly inspiration day and we are so stoked to be a part of this amazing chix community. 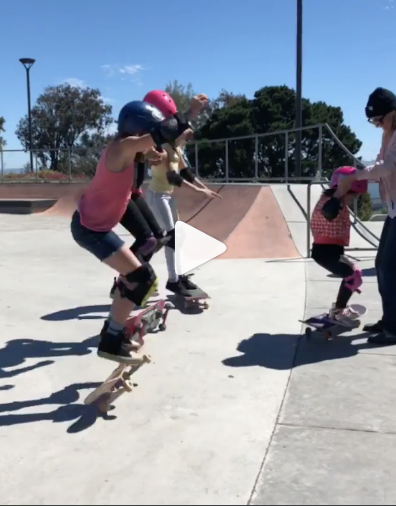 Grandma brought her 3 grandkids to learn to skate but by the end of the day, she found herself falling in love with skateboarding at age 60. She even won this longboard! Thank you, @stompsessions and @nealmimsfor your help with the clinics ! 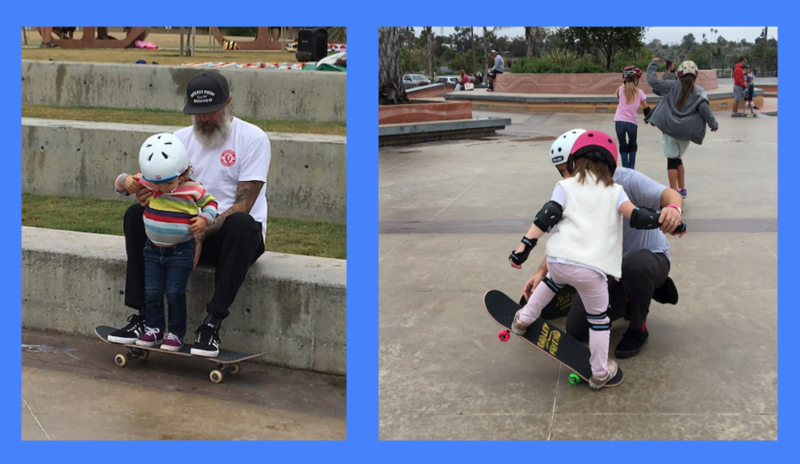 You are always the right age to have fun skateboarding and to make a positive contribution to your community. 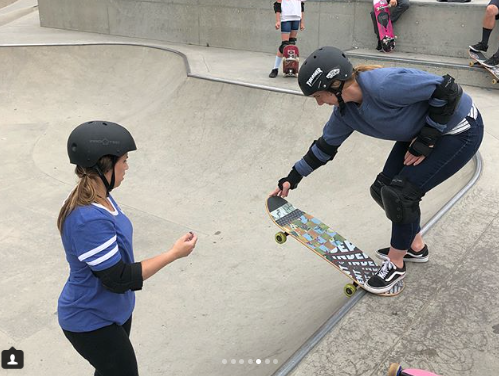 More girls skateboard when they see girls having fun skating, receive encouragement, and have events like this – so I hope you share your stories of having fun skateboarding with the blog soon. 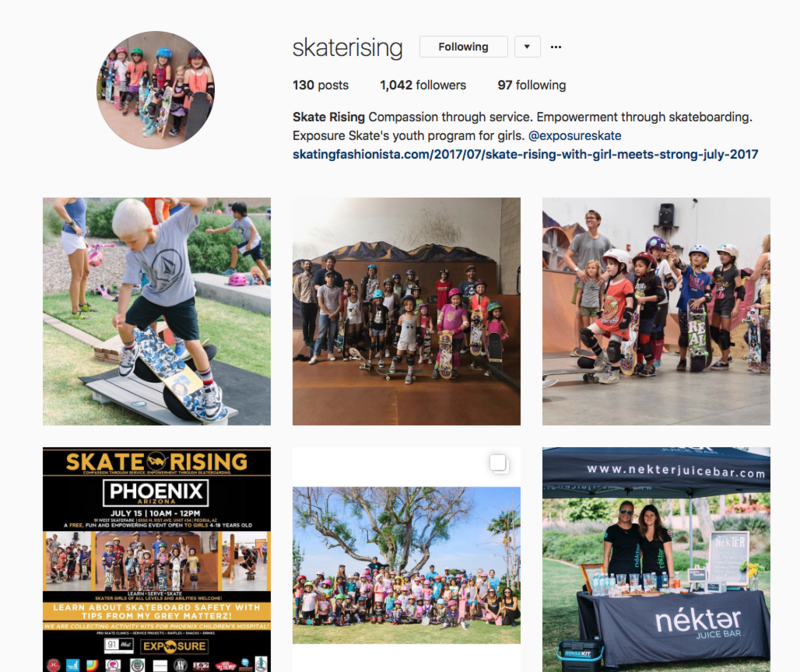 To find out more about Skate Rising, EXPOSURE Skate’s youth program, follow them on IG or contact the founder/organizer, Calli Kelsay at calli@exposureskate.org. 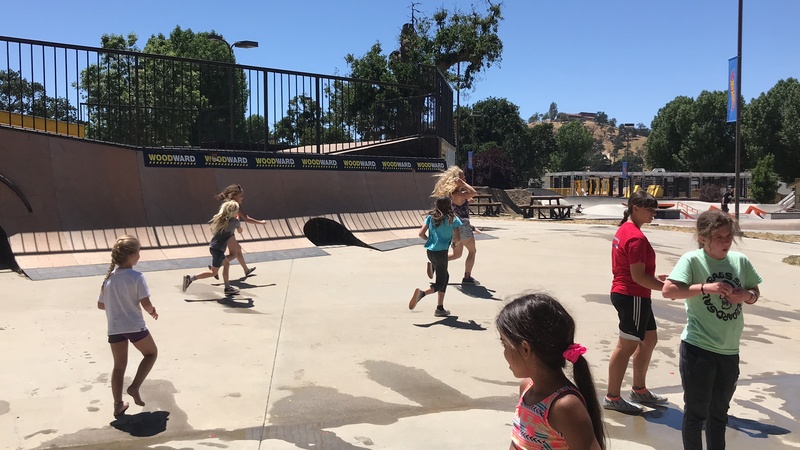 Traveling from Encinitas, California we headed north to Sky Park in Scotts Valley, California. and assembled over 100 kits. 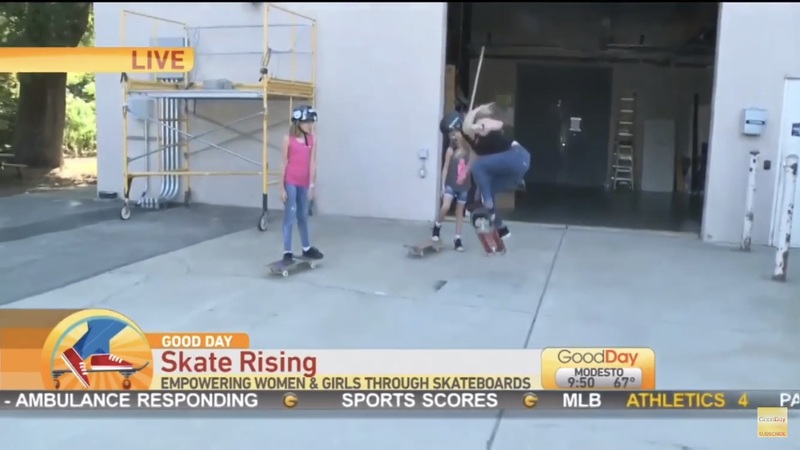 thanks to the local support of Good Morning Sacramento who shared our event. 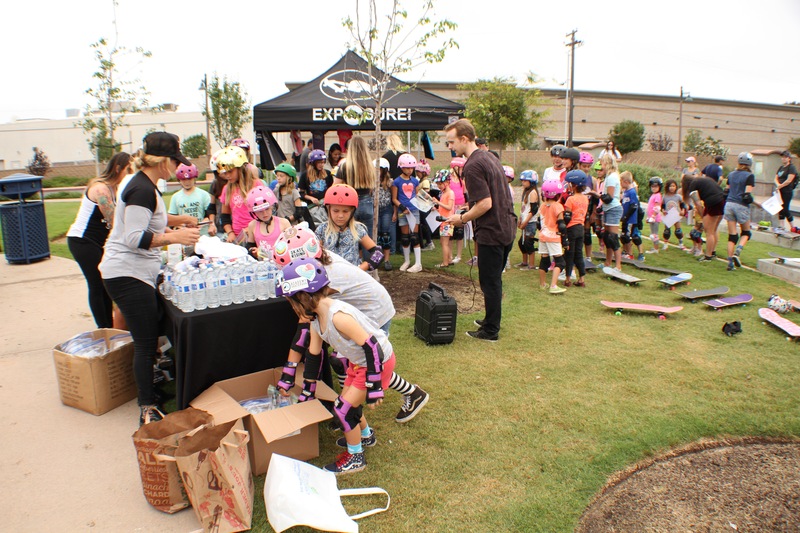 After the skate clinics and kit building, assembled kits were passed out to the homeless. 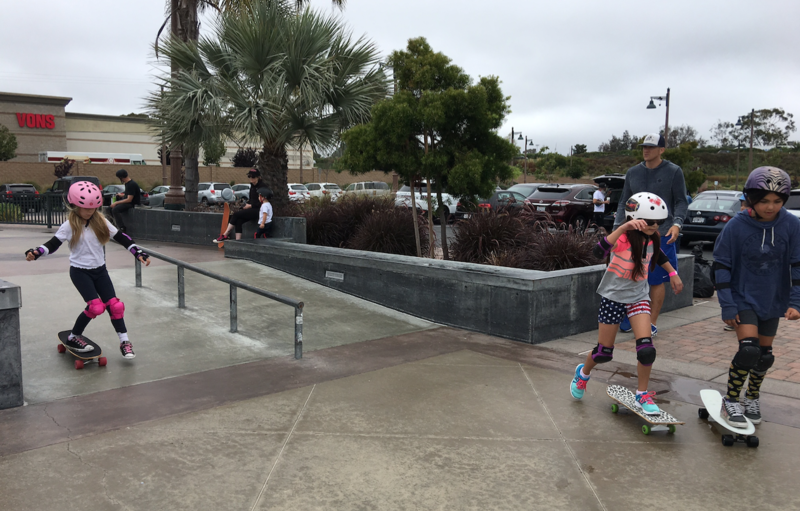 The next stop was Hill Top Skatepark in San Francisco for some “pancakes”. Then it was Napa time. 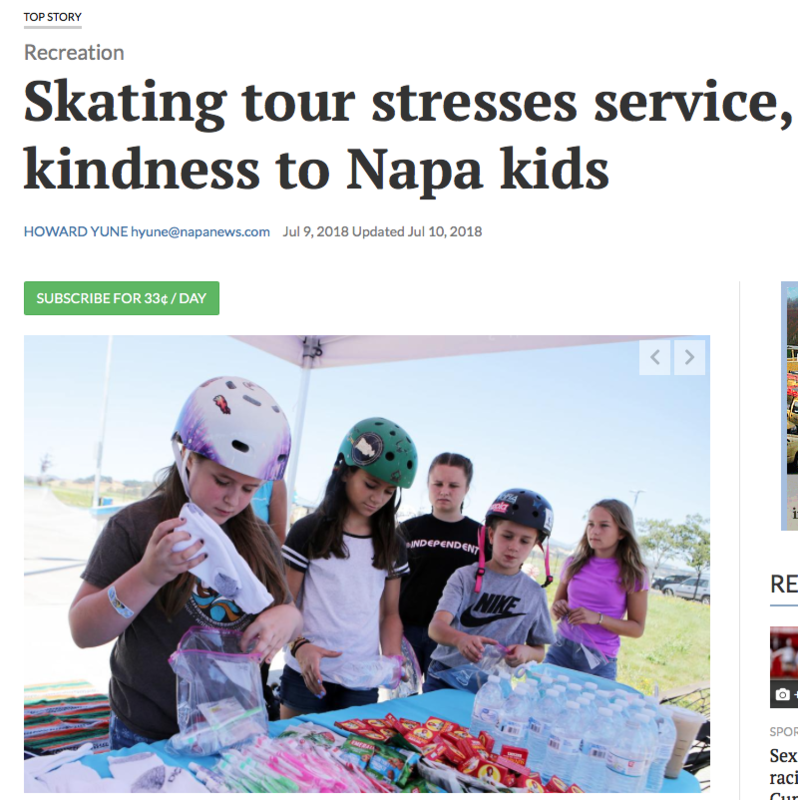 For the entire scoop on Napa check out Howard Yune’s coverage by clicking below. The trip wore me out and pushed me outside my comfort zone, literally I’ve learned I need to drink lots and lots of water because the Northern California stops were much hotter than my usual parks, but I am so glad for the experience. I loved meeting all the people along the way and being a part of making a positive difference. I’m excited for Saturday July 14th. I won’t be at the Eugene stop, instead I’ll be at the Encinitas event. Plus there are other events, so I hope you can make one of them. 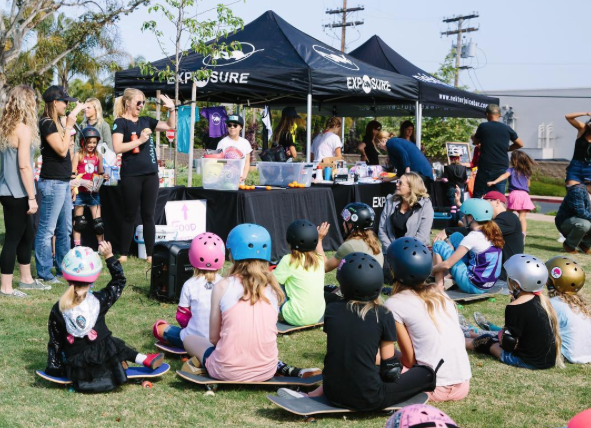 These events truly show that girls skateboarding is a global activity and that everywhere around the world you can make the choice to be kind and be a part of your community. 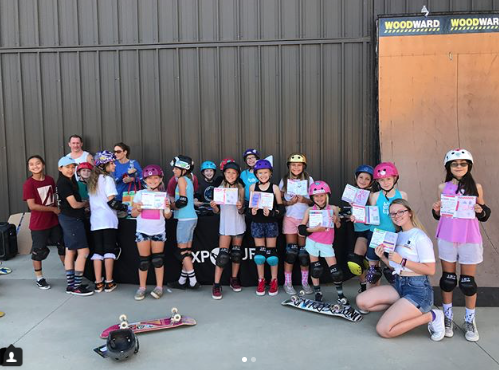 Last week was the largest Girls Rule Week at Woodward West, to date! 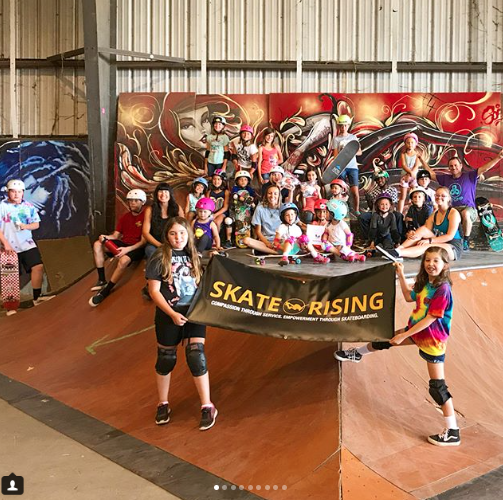 I was privileged to be a part of the camaraderie at Woodward West from June 24 – 30th 2018. 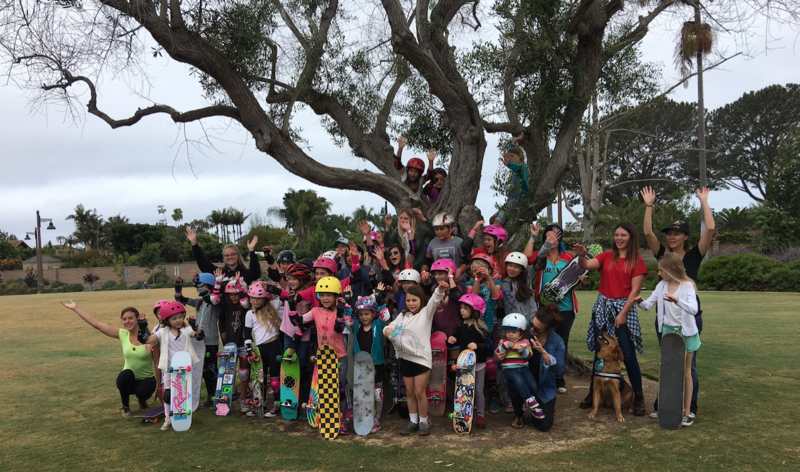 All the girls who actively participated saw their skills flourish both on and off the skateboard. 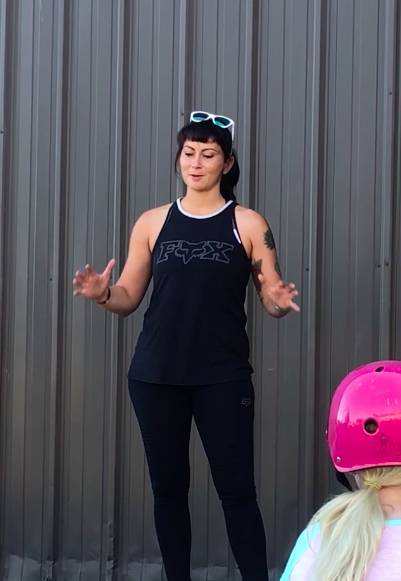 As we heard from guest speaker Nina Buitrago, BMX pro, we all start as beginners. Being willing to begin is a huge accomplishment because it means we are pushing through our fear. 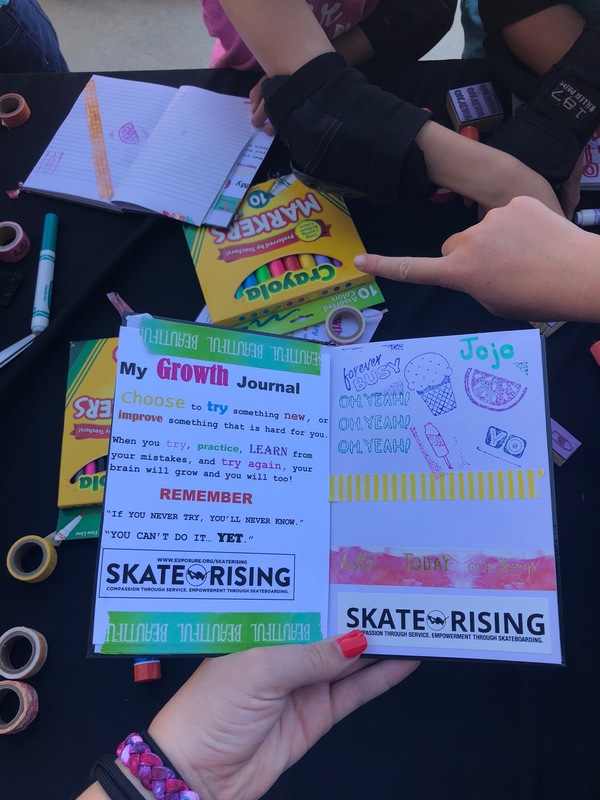 We learned so many ways to push through our fears including making Growth Journals, which is a safe place for us to write about our goals and the progress we make towards them. 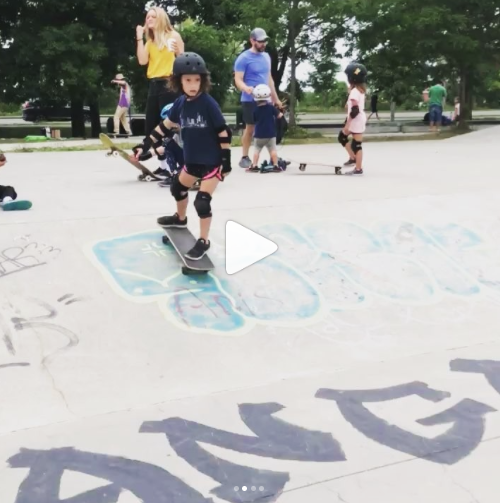 Falling in skateboarding and life are inevitable, so learning how to learn from mistakes and having tools to keep us motivated and focused are keys to success. To show our focus and what’s important to us we made vision boards. 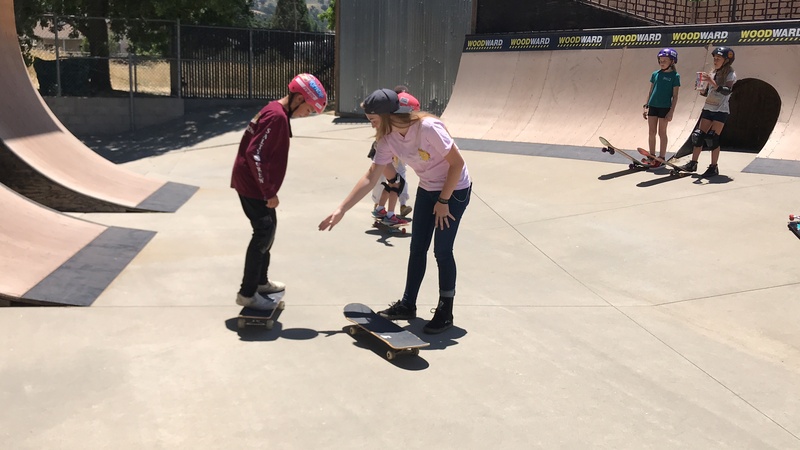 To share our love of skateboarding we joined Skate Rising in a Learn to Skate Clinic for all campers. 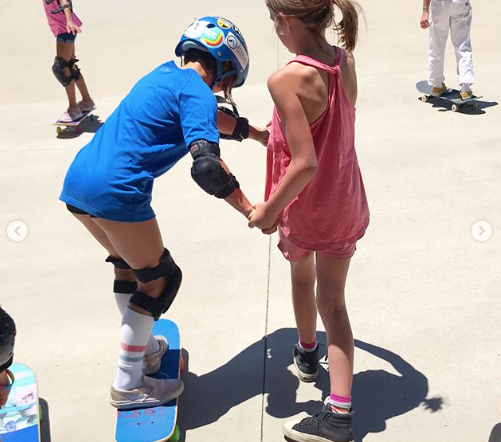 Helping others learn to skate is just one way we spread kindness, which is a pledge we made at the beginning of the week and a pledge we keep making daily. 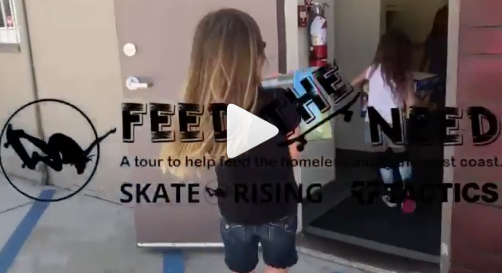 Moving forward we will always have the memories of camp, plus we were introduced to programs like Feed the Need which will allow us to continue contributing to the community while having fun skateboarding. 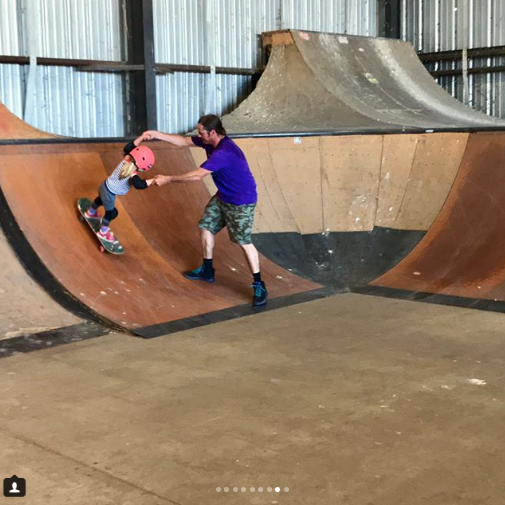 When we accept ourselves & others, failures & imperfections included, we are able to focus on what really matters: having fun skateboarding & making the world a kinder place. 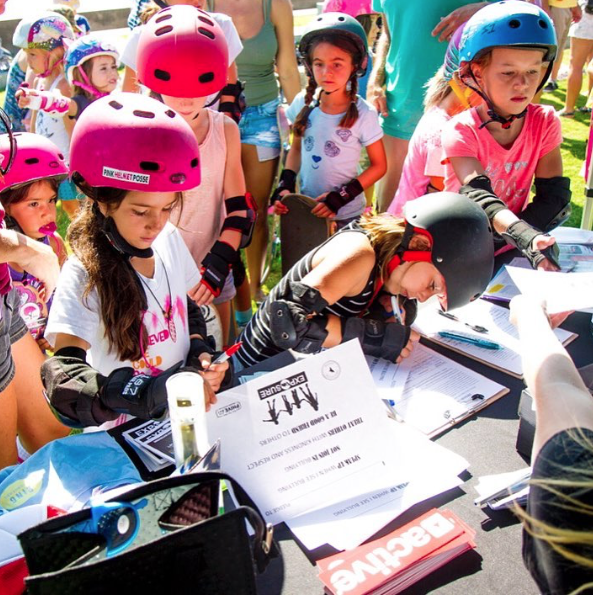 Girls really do rule when it’s sisterhood before competition which is what Girls Week with Skate Rising at Woodward West was all about. 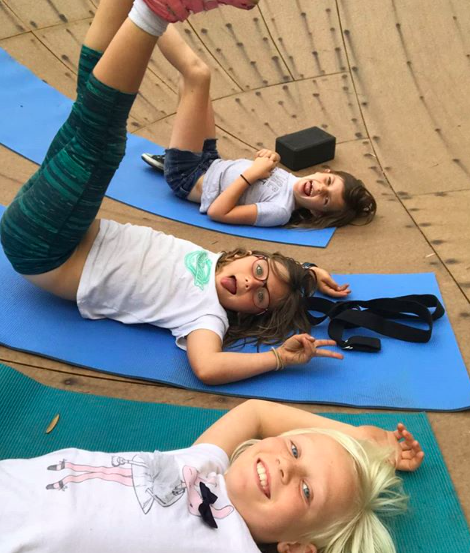 After three days of crazy, non stop skating it was time to take a small break and refresh our minds and bodies with yoga. Thanks to Bridget (aka Yoga for Skateboarders) everyone had the chance to work on partner yoga this morning. Bridget focused on partner yoga to stress the importance of knowing that you can’t do everything alone. It’s okay to ask for help and to work with others to accomplish your goals. Positivity grows when we work together. Once we got into the groove things started to get wild! 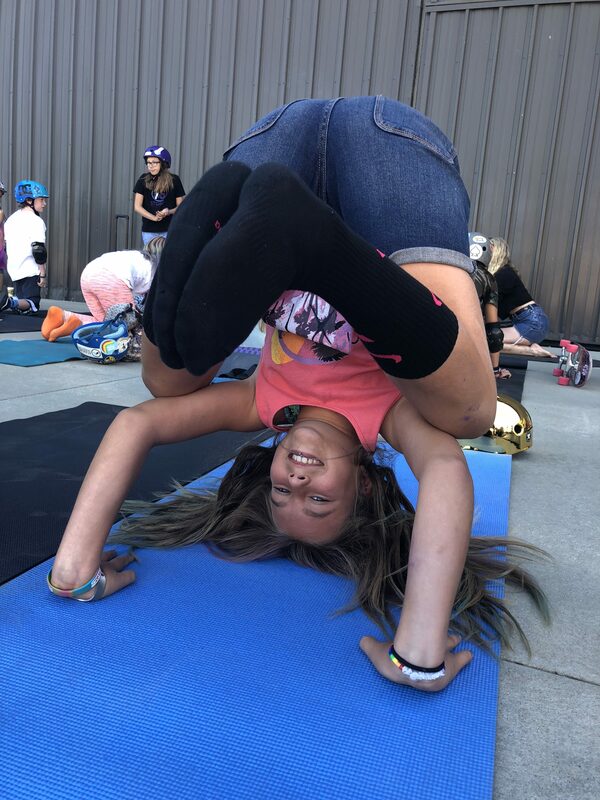 Head stands had their own personal twists. 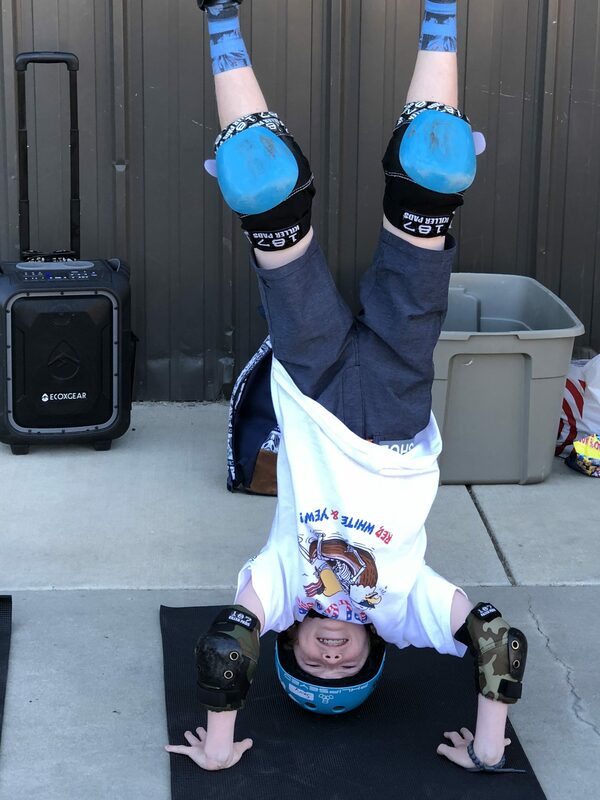 Above someone knows the advantage of a Triple8 helmet and 187 Pads when doing handstands and below a personal touch headstand. With our stretching complete and our minds cleared, we were ready to go skate. I’ve always thought of skateboarding as rolling yoga because balance is key in both and both have the ability to clear your minds and put you in the zone. 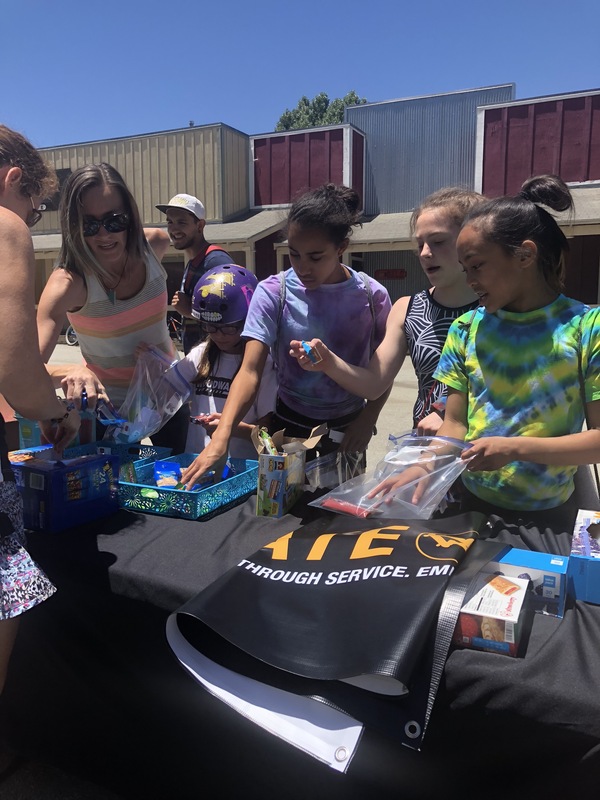 Staff and campers came together to build kits for the homeless. Kits consisted of granola bars, socks, a toothbrush and toothpaste, other snacks, and a note. 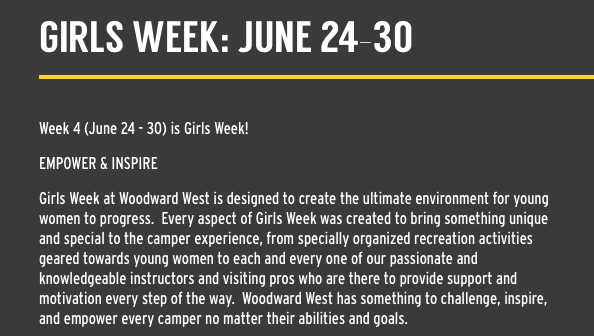 Over 50 kits were made with love here at Girls Week Woodward West! 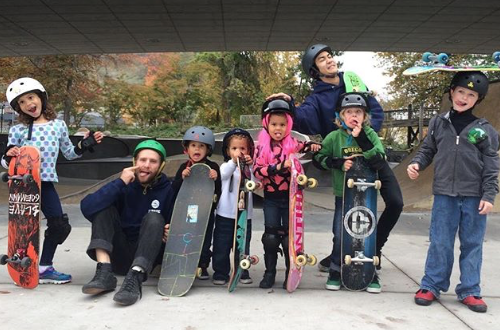 Compassion through service and empowerment through skateboarding. 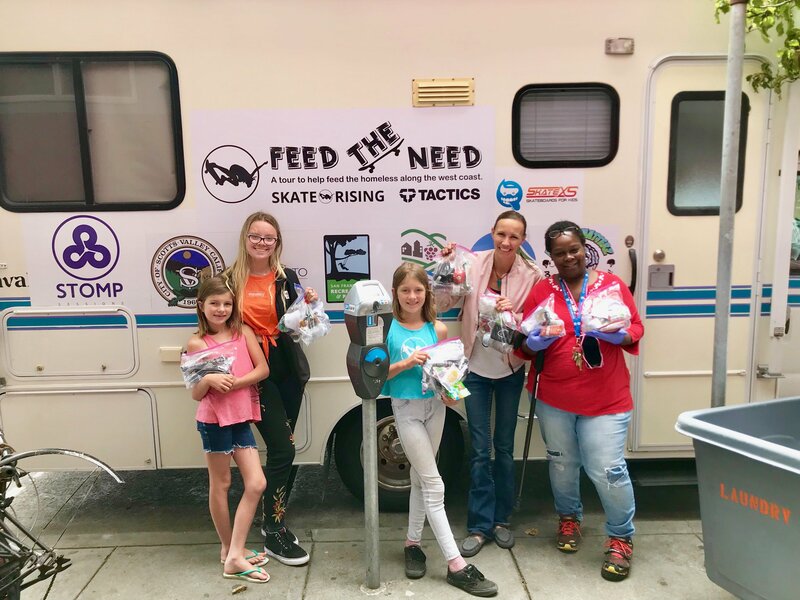 I love that the girls not only learn about homelessness, but are given the opportunity to do something about it. Knowing a problem exists is certainly the beginning but doing something about the problem leads to a solution. Thank you to everyone who helped put some kits together today! 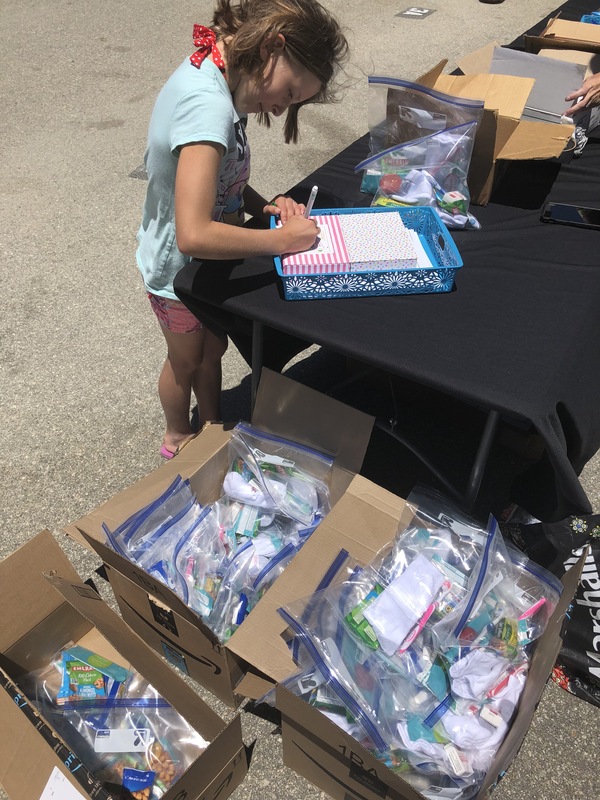 Fifty kits might be a small number compare to the number of homeless in the world but every kit has the ability to inspire someone else to make a kit. Socks remain the #1 most requested clothing item at homeless shelters. They donate a pair for every pair purchased but there are still so many in need. If you don’t have anything to bring, still come because the note you write for one of the kits will truly mean something to the person receiving it. Taking time to write a note, listening to someone, acknowledging someone with a smile are huge acts of kindness. 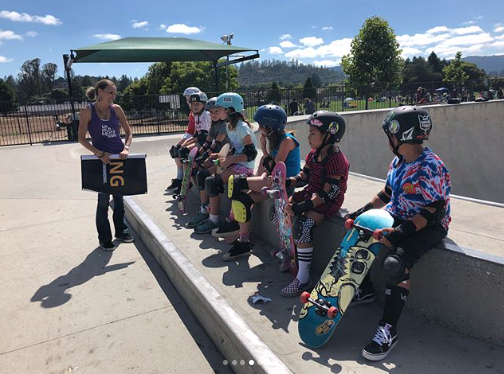 Plus on July 14th which is Girls Serve and Skate Day there will be events in addition to the Eugene, Oregon flagship event. 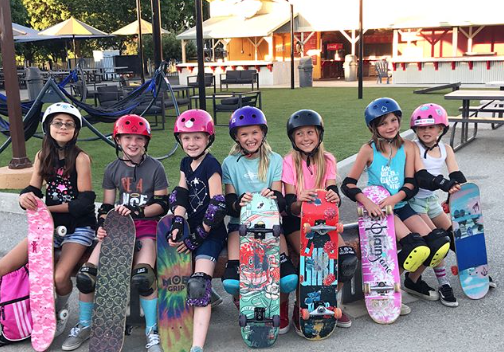 Till tomorrow – Friday the last full day of Girls Week 2018 with Skate Rising at Woodward West – keep it stylish on & off the board. 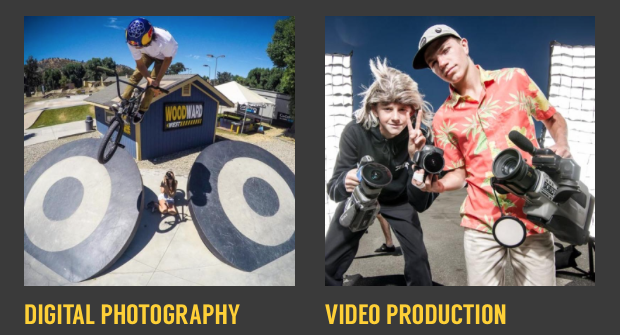 Woodward West is known for its large variety of action sports facilities. People come from all around the world to visit Woodward West and learn from the best. 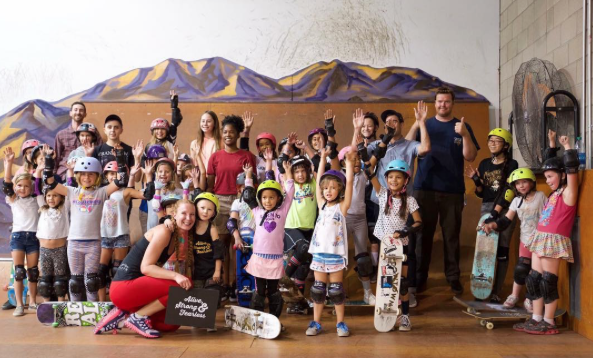 Several pro skateboarders participated in the clinic. I love to see people try new things. Trying new things is the true spirit of the Growth Mindset because all new things can be scary. We each have the choice to power through the fear because as we heard from Nina on Tuesday fear is not real. We all start as beginners and with willingness to practice and learn from mistakes we have the ability to achieve our goals. Everyone’s goals are unique to them. 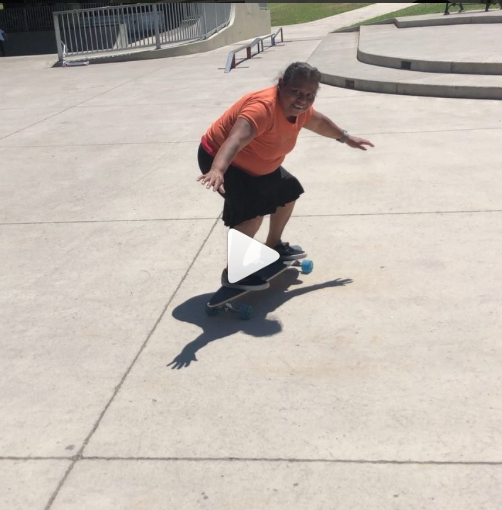 If you’re having fun skateboarding, you should keep skateboarding and set goals that you are comfortable with. 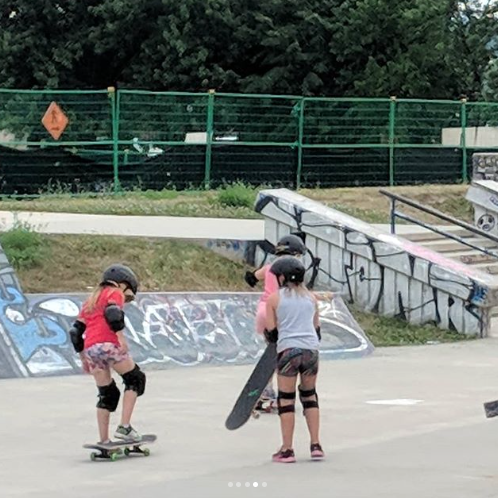 It’s better to be the girl who tried skateboarding and did not like it then the girl who just wondered because she was afraid to try. I hope that whatever it is you are going to try, you have the benefit of those who will “hold your hand” and cheer you on. Yes, you have to believe in yourself but it’s so much easier to do that when you surround yourself with those who believe in you. And please pay it forward by encouraging others. It’s so inspiring to see pros take time to help beginners. Woodward West might also be known for it’s weather. It gets HOT during the day. So there’s tons of sun screen application and drinking water plus there’s time for water balloon fights! It’s so hot the water dries super quick! Fighting is not the answer unless it’s water balloon fighting in the heat. Hope you are enjoying the posts as much as I am enjoying writing them. For more pictures click below. 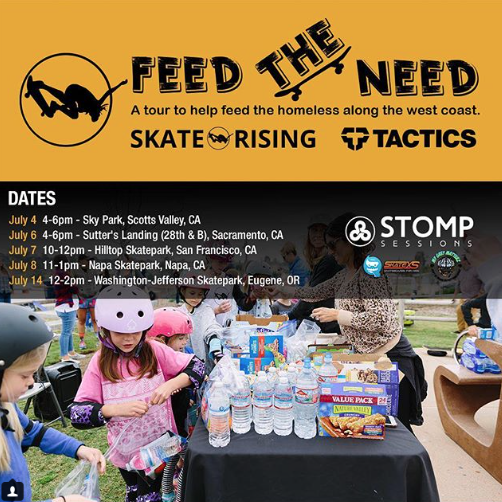 Skate Rising 2018 “Feed the Need Tour” presented by @tactics! is just a week away. 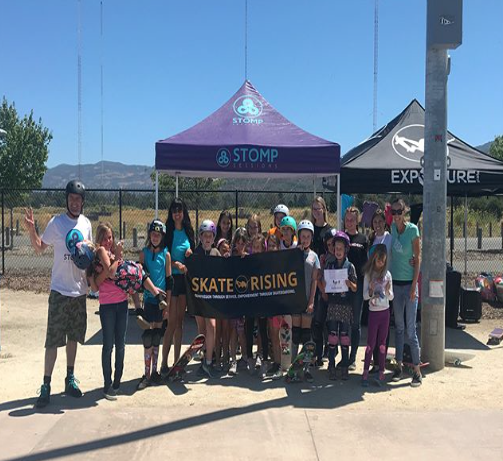 Come join us at one, or more, of the events for an opportunity to have a positive impact on the world around you and participate in free learn-to-skate clinics with @stompsessionsprofessionals. Click on the pictures above to learn more. 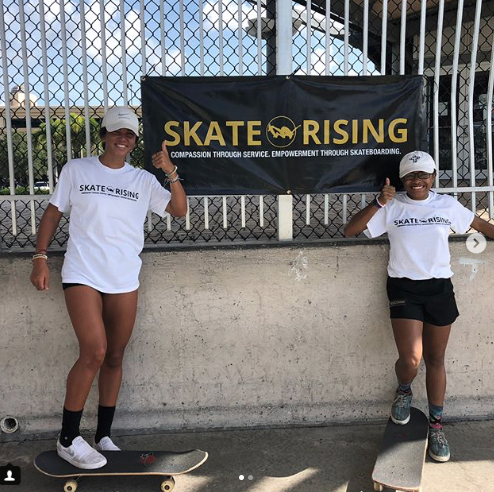 Skate Rising is “Compassion through service, empowerment through skateboarding.” Each of the events includes education, community service, and skateboarding – you’re never done learning on or off the board and everyone benefits when we support and encourage each other. I’m on a mission to hit the CA locations and I’d love if you shared your stories of the stops you hit (tag or email me to have your story shared in a blog post). 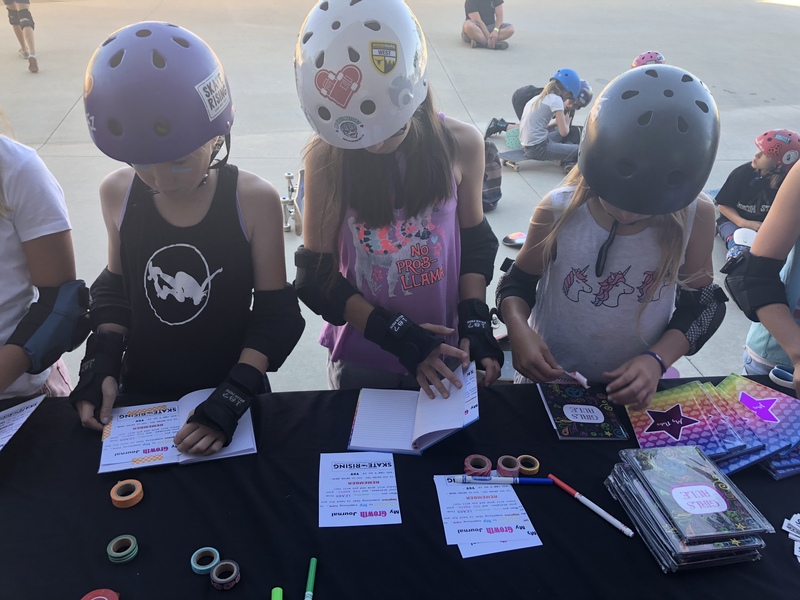 Monday night at Woodward West with Skate Rising saw the girls pull out the glue, magazines, and stickers to create vision boards. 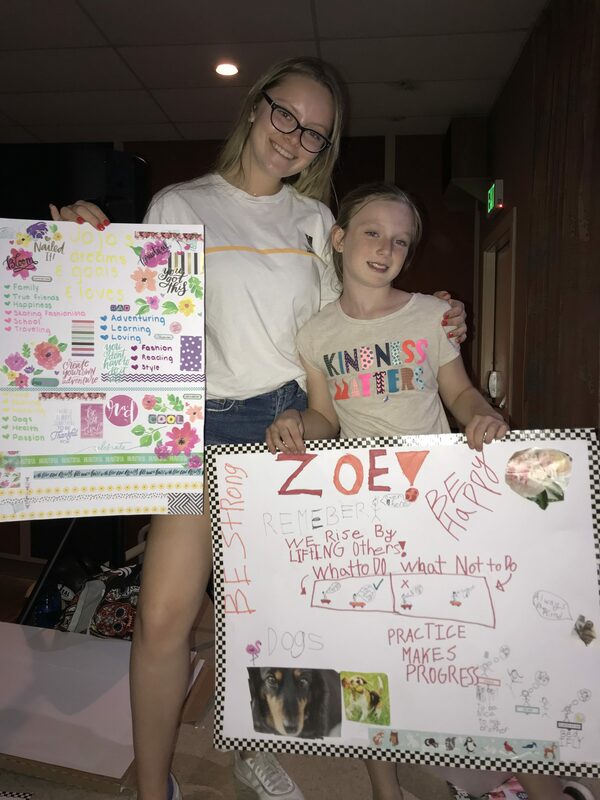 Before the creating, the girls learned what a vision board is and how it helps you be your best. A vision board is a tool used to help visualize and concur goals. Vision boards have worked for many. Studies show that visualization increases athletic performance by improving motivation, coordination and concentration. It also aids in relaxation and helps reduce fear and anxiety. There is no wrong or right way to create a vision board. Every person’s vision board is unique because it consists of their hopes, dreams, goals, and things they love. The key is being creative and capturing what you want your future to be. Below are a few of the vision boards. Personally, I am a big fan of vision boards. I use them and have blogged about how Skate Rising encourages their use. I love seeing my vision board become reality. My board helps keep me on a path that allows me to achieve my goals. Creating vision boards is not a one time event. As you grow your vision grows and you create new vision boards. For behind the scene commentary on my vision board Dreams, Goals & Love & why learning is important to me click here. After completing our vision boards, we headed off to sleep so we would be bright eyed and bushy tailed for the next morning. In the morning, we talked about the importance of powering through our fears. To show that everyone has fears and that fears do not have to stop you, we shared memories of how we conquered our past fears. Sometimes we forget that things we used to fear are things we now do normally. How did something go from being a fear to normal? We faced the fear and even when we fell we did not give up. Falling is not failing, it is an opportunity to learn from our mistakes. 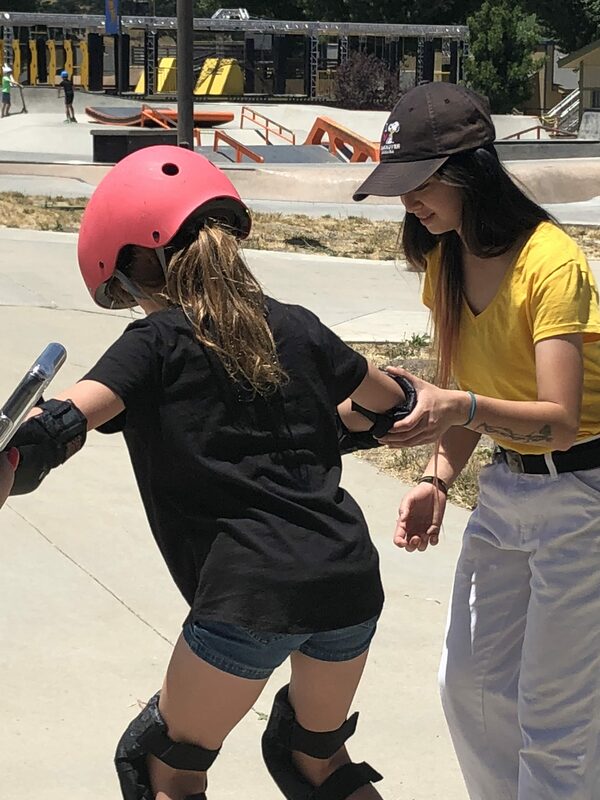 To further inspire the girls to believe that they could power through their fears, we heard from guest speaker Nina Buitrago, an accomplished BMX rider. She talked to us about how she handles fear and gave us tips on how to power through our own fears. The message I heard was that fear is not real, it’s the self-talk that your mind creates. Fear causes you to second guess yourself. She, like everyone else, still has fear. Some people are just better at hiding their fear. She handles fear by breathing, centering herself, preparing/training, and surrounding her self with friends. To hear her click below. Full of inspiration, we headed off to skate. How do you face your fears? For me it helps to realize that they stand between where I am and where I want to be. The vision board makes it clear as to where I want to be. So then it’s my choice to pursue the vision or let the fear stop me from achieving my vision. Fear can be healthy. Let fear be the motivation to wear safety gear, practice, learn from mistakes, listen to good advice, but don’t let fear stop you. If you can believe, visualize, and work you will succeed on & off the board! 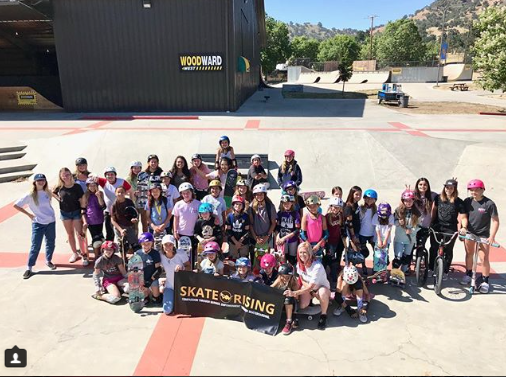 So far Girls Week has been amazing – what do Skate Rising and Woodward West have in store for the rest of the week? With Calli as our leader, I’m sure there’s much, much, more to come so stay tuned! Woodward West Week 4 has started off with a bang! This week is all about spreading girl power and kindness through action. 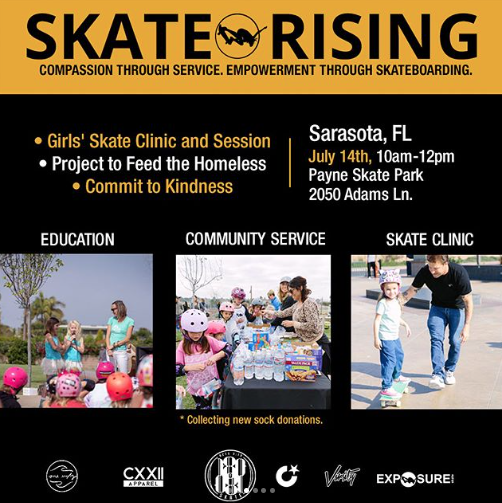 Skate Rising founder Calli Kelsey is working with us to create daily service projects. A growth mindset enables you to believe that you are capable of anything you set your mind to. With a growth mindset you are kind to yourself and others as you practice. Even when you fail, you stay kind knowing that failure is an opportunity to learn. Progress might be slow, but if you keep practicing, believing, and learning from your mistakes you will succeed. 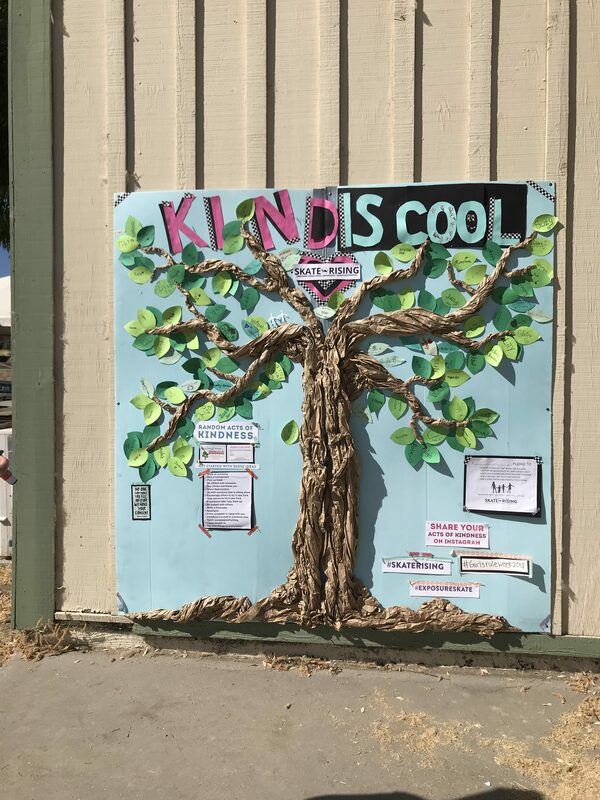 Girls created growth journals. Each girl’s journal is a place to write her goals and her progress towards them. The journal is for camp week and life after camp. 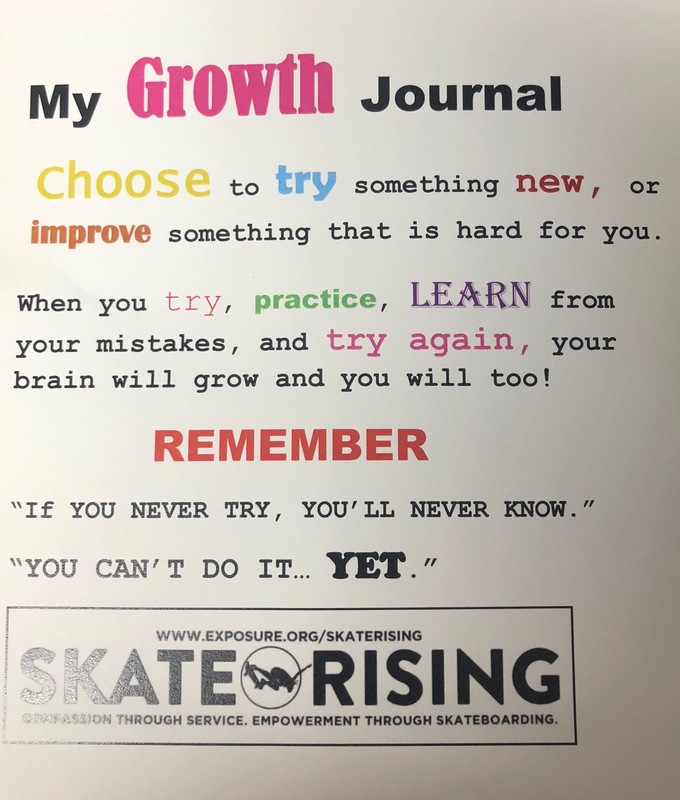 A growth mindset becomes a way of life when you have a journal to help you remember to focus on the positive and keep working towards progress. Each goal you achieve is an inspiration to try the next goal. 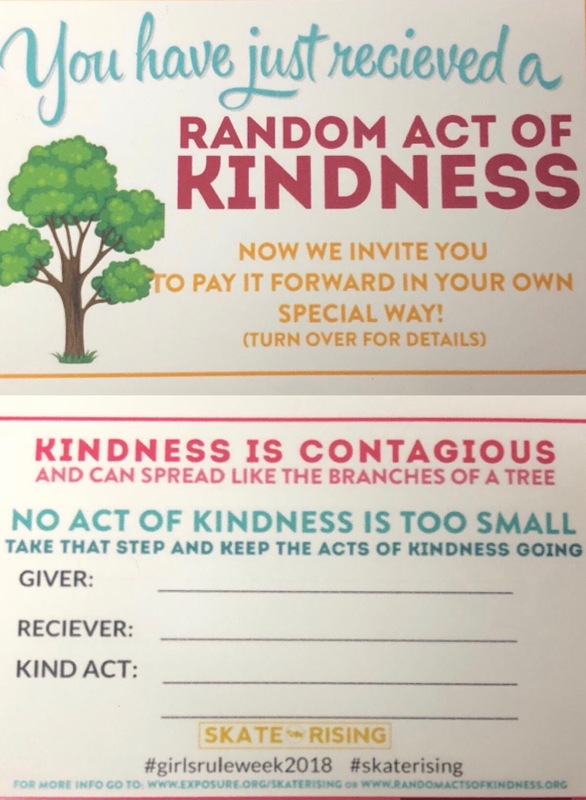 received Random Acts of Kindness Cards. The cards are physical reminders that each of us has the power to spread kindness and that kindness comes in all sizes. Something as small as a smile might be exactly the thing that can turn someone’s day around. Day one has been amazing! I’m excited for the upcoming projects and will post them as soon as they are completed. I encourage everyone reading this to take the time to make your own Growth Journal and Commit to Kindness. For now we are off to skateboard with our new tools. 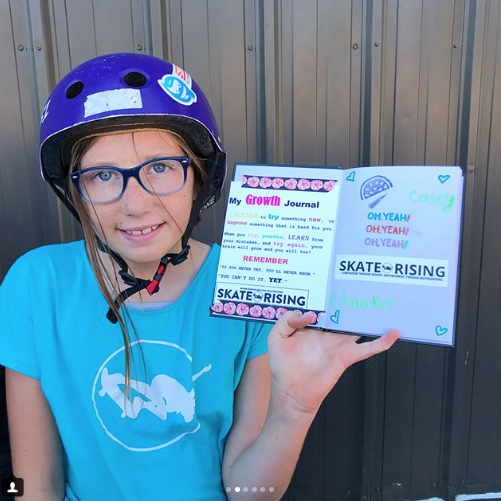 A Growth Mindset, to know every trick is a trick we can work towards and a kindness reminder to encourage ourselves and our fellow skaters with words & smiles both on & off the board. For more photos click below. August 14, 2017 will be the one year anniversary of Skate Rising. 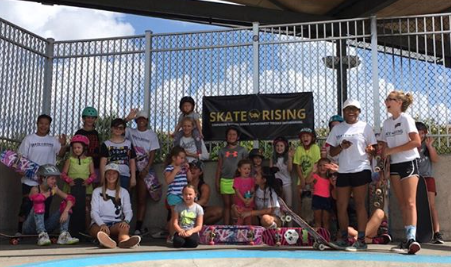 Since August of 2016 the girls have been meeting the 2nd Saturday of every month under the leadership of Skate Rising founder Calli Kelsay. I had the chance to check in with her and here’s what she had to share. 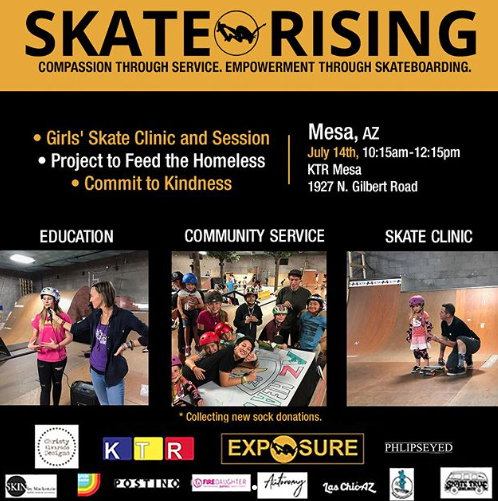 For those not familiar with Skate Rising, what’s Skate Rising’s mission? What inspired you to start Skate Rising? 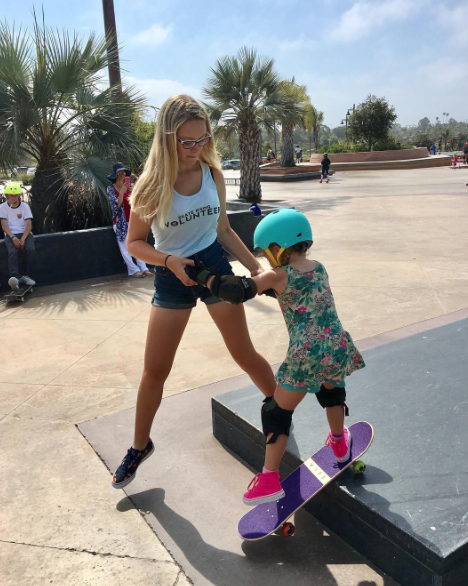 I was inspired to create Skate Rising after seeing the positive life lessons that come with skateboarding arise in my own children. I saw my oldest two children, Aubrey and Kirra, push through fear, gain confidence, and learn to fall and get back up on their own two feet multiple times. After seeing that I knew this sport/art form would positively impact other young girls if given the opportunity. We added the service element because service teaches compassion and the world will always be in need of compassionate, kind, strong women. Although this program may have started as my vision, this program really took flight with the help of my close friend Nina Seibert, she happens to be the creative one behind the scenes. 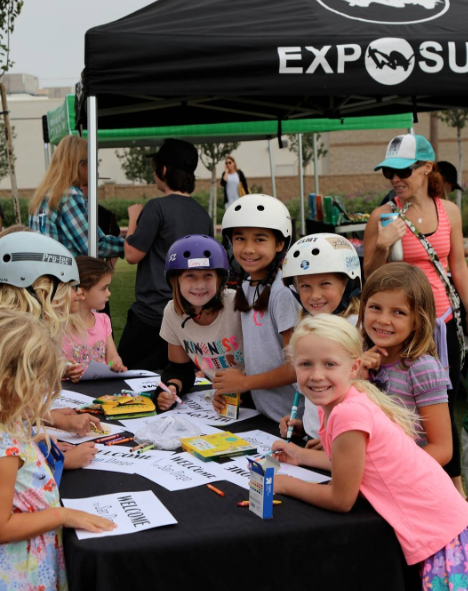 Also partnering with Exposure Skate, the large skateboarding non-profit, was also was a great fit for us. Without people like Nina, Amelia, and Lesli, this program would not be what it is today. At each event there is an activity. 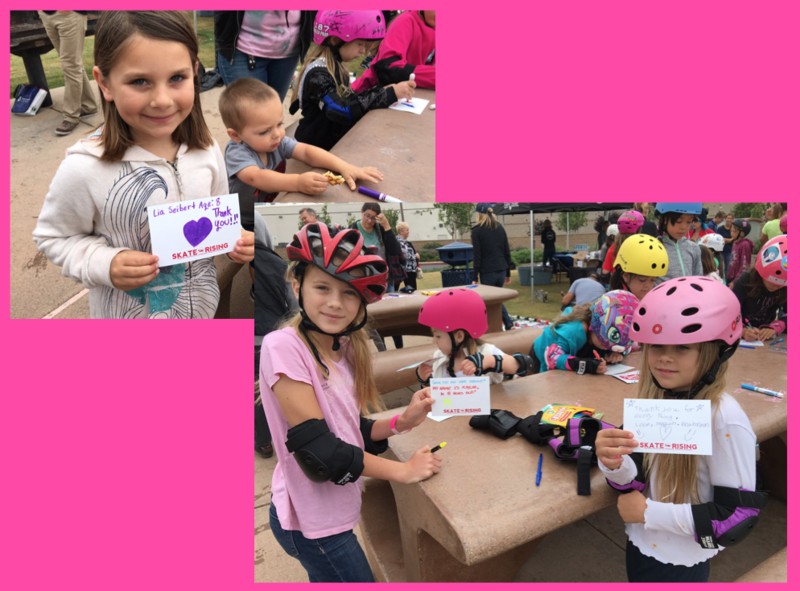 Like the Commit to Kindness (anti-bullying) contracts at the very first Skate Rising and making cards for veterans at the June 2017 event – how do you think of the activities that are important to the community & of interest to the young girls? 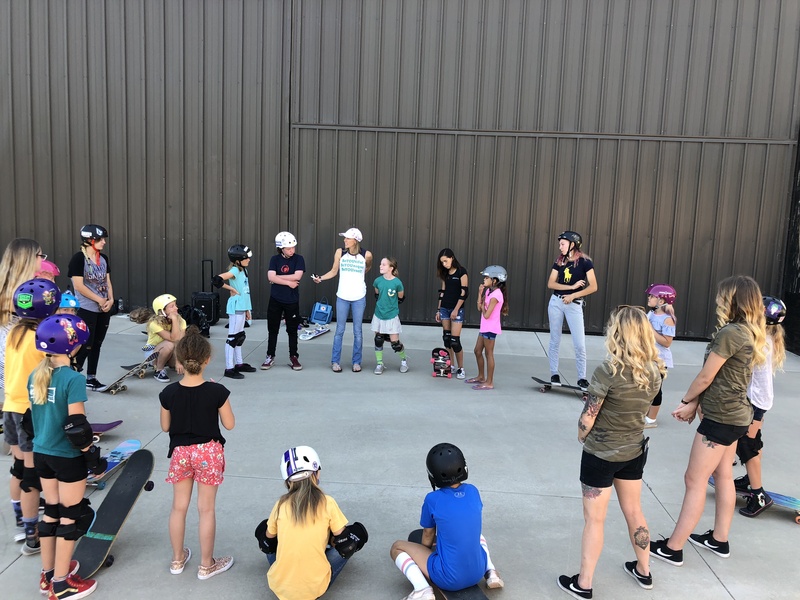 We have specific topics to work with the girls on like; kindness, compassion, anti-bullying, welcoming new members to our community, believing in yourself, pushing through fear, and more! We decide who we can help based on the needs we know of at the time and then cater the theme. There are always a lot of people and groups that need help so, if we know about them we try to help where we can. I have personally seen Encinitas grow as more girls come monthly. 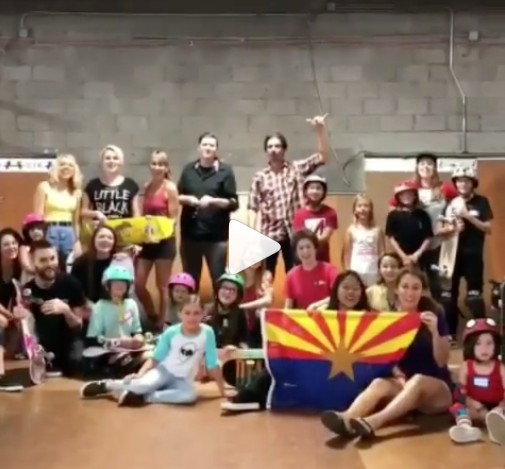 There’s also Skate Rising Phoenix now. How amazing that within a year there were two locations. Are there plans for more? We are definitely open to growing the program nationally and internationally if the right opportunity were to arise. This program does take multiple volunteers with specific skill sets to run it and make is successful for everyone so we will always be cautious yet optimistic with opportunities that do come. 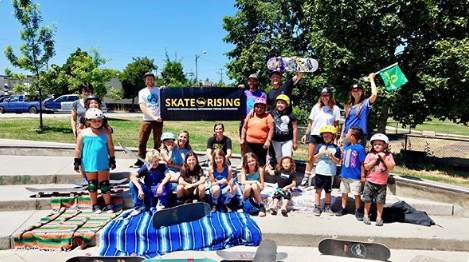 What else would you like to share about Skate Rising – from your favorite moment to your hope for the future? 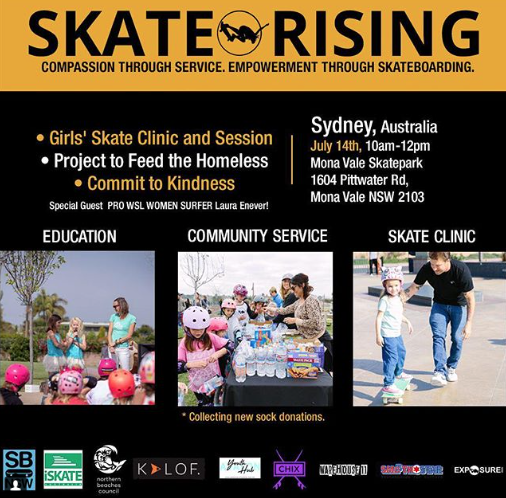 Skate Rising has been such an amazing program to be part of. From the volunteers, partnering organizations, to the participants, and the recipients of our projects, it has been amazing to see how many people have been impacted in some way in such a short time. In fact, just in the past year over 2500 people have received assistance from our projects. 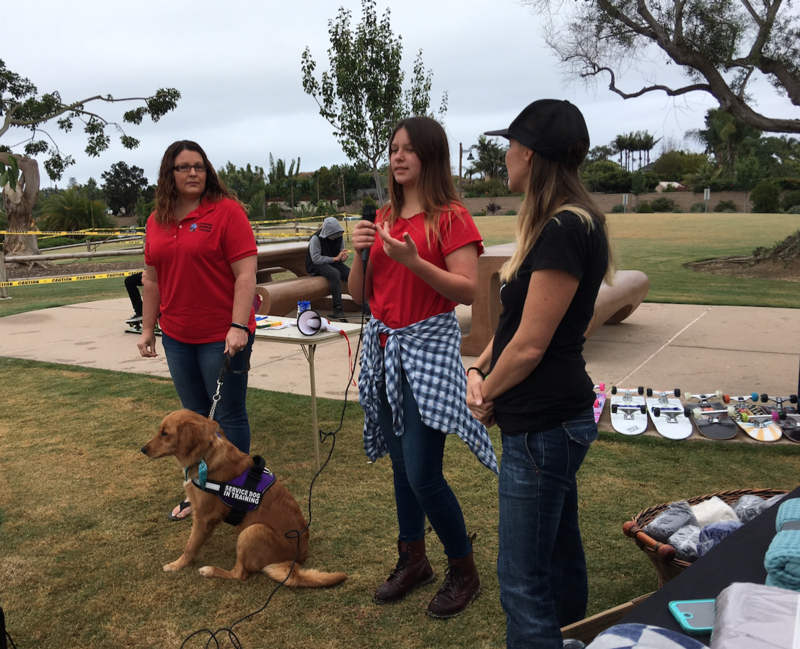 Some of those that have benefited are refugee families, patients at Rady Children’s Hospital, victims of domestic violence, Veterans, and homeless individuals. To me this is everything. If I can have but a small part in helping the youth of today become the leaders of tomorrow then I feel extremely grateful for the opportunity. 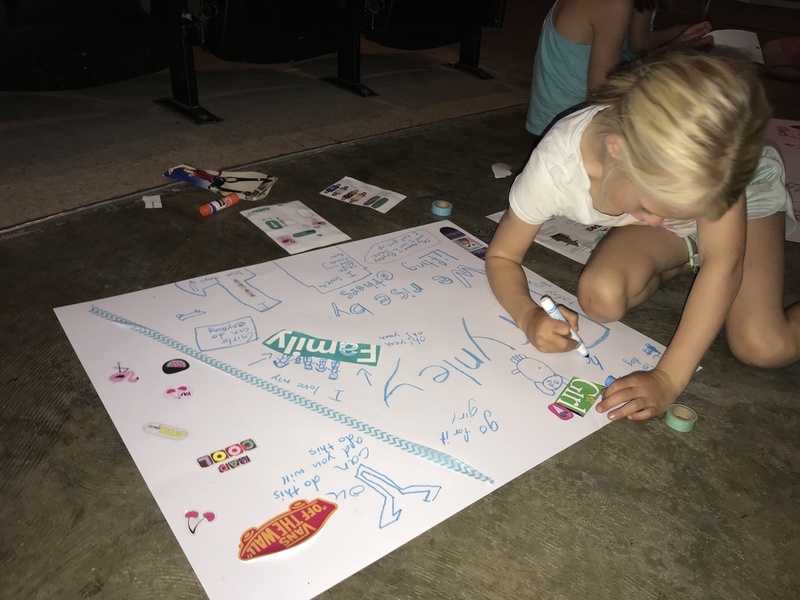 Last month we had an event focused on empowering ones-self and pushing through fear, it was amazing what even five year old girls had to say at the end of the event. They shared how they had pushed through fear by going down a bigger ramp than ever before or how they had tried an ollie. My hopes for the future would be that the existing participants will continue inviting more girls to participate, learn, and serve with them, the program grows to more areas and continues to advocate for those less fortunate. Just to see the positivity that has taken action has been very impactful for myself and my family. 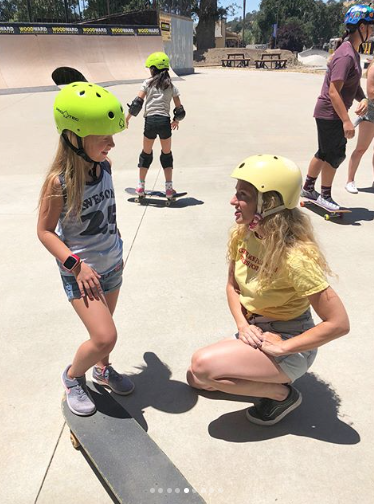 Thank you Calli for taking the time to do this interview and for all the time you take to make Skate Rising happen and to mentor girls such as myself. You’re a huge inspiration to me & countless other girls on & off the board. 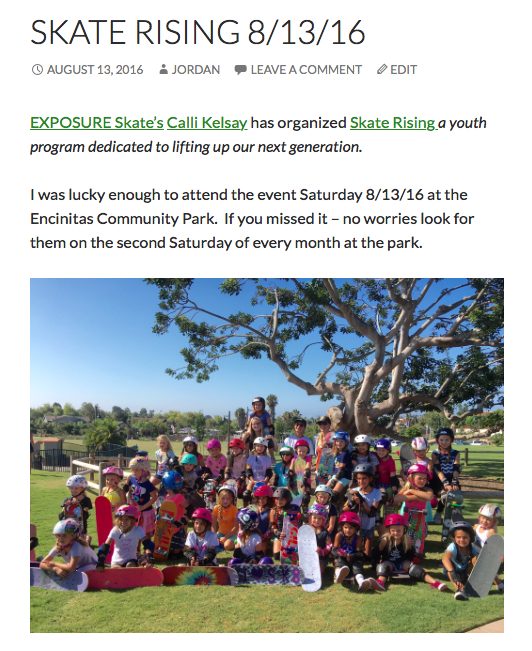 To stay up to date with all things Skate Rising give them a follow and if you can make it out to the Encinitas Community Skate Park the 2nd Saturday of every month from 9am – 11am to share in the fun or if you’re in the Phoenix, Arizona area check them out the third Saturday of every month from 10am – noon at 91 West Skatepark. On June 10, 2017 the morning started off rainy. 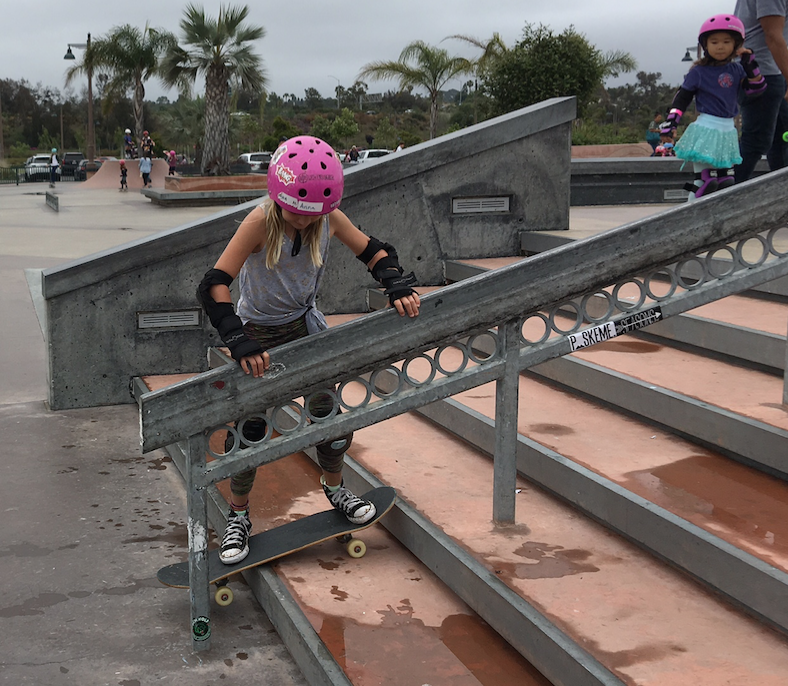 Rain and skateboarding don’t go together so it looked like the Skate Rising event planned for the Encinitas Skate Plaza would be cancelled. 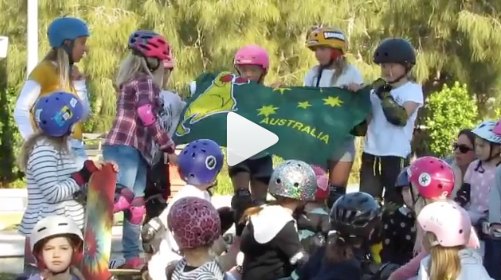 What you see above is a miracle – the skate park dried up and the girls came out in force! 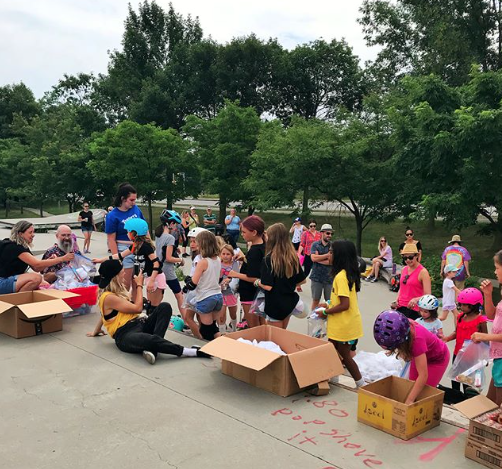 By the end of the event over 60 girls came to skate and be of service. The service project for the month was collecting blankets & making thank you cards for veterans. 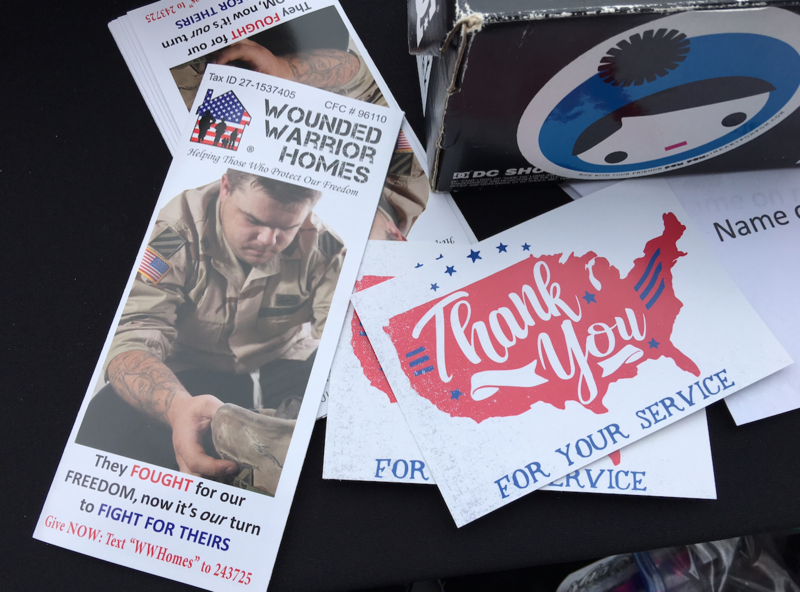 Before making the cards the girls heard from Wounded Warrior Homes a non-profit in Southern California providing transitional housing for single, post 9/11 combat veterans with TBI & PTS. 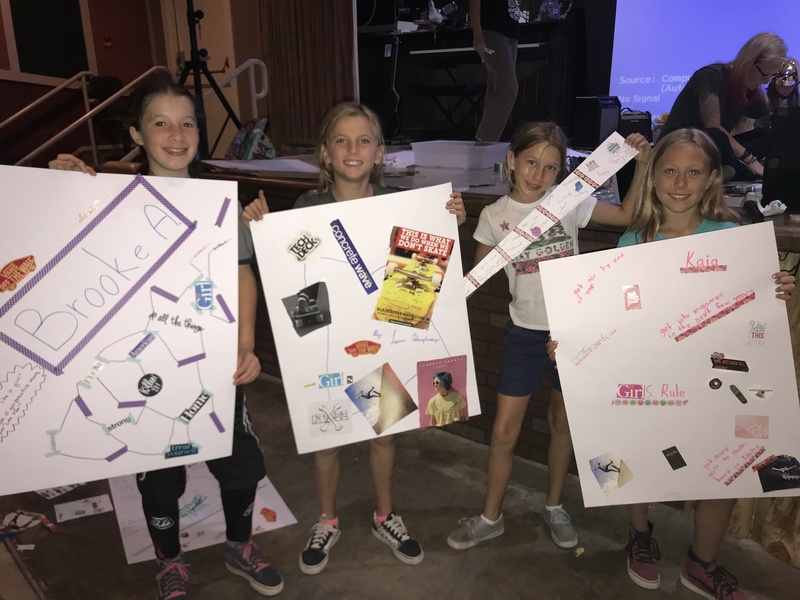 The girls got to hear first hand how girls can make a positive difference in the world by volunteering and how volunteering helps the volunteer too. Volunteers learn new skills and make new friends. The girls also learned how to interact with service dogs when they’re working. and before long had beautiful messages for the veterans. Thanks to parents’ support the girls were also able to donate 35 blankets to Wounded Warrior Homes. 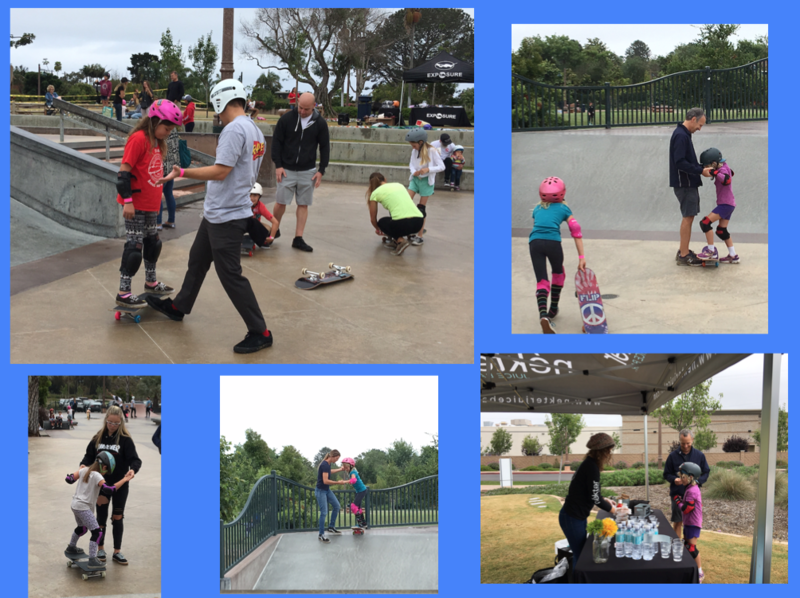 Skate Rising happens because of all the parents and volunteers who come out each month. 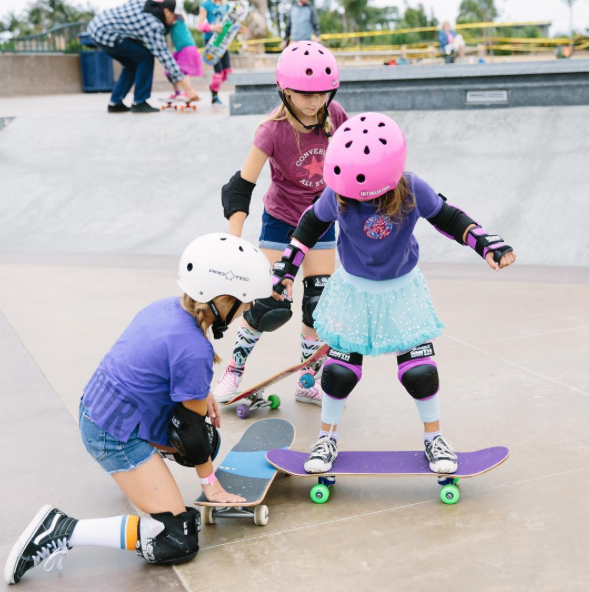 Now we can say in rain & shine, they come out to encourage girls to skate, find friends who skate, and learn the importance of giving back to the community. and when they receive encouragement. 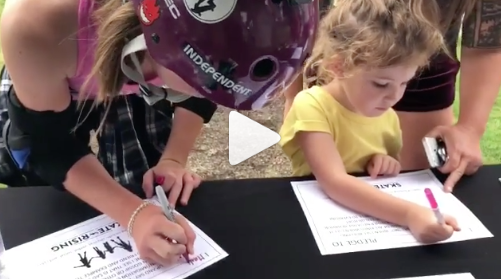 You can always find girls skateboarding & tons of encouragement at Skate Rising events. 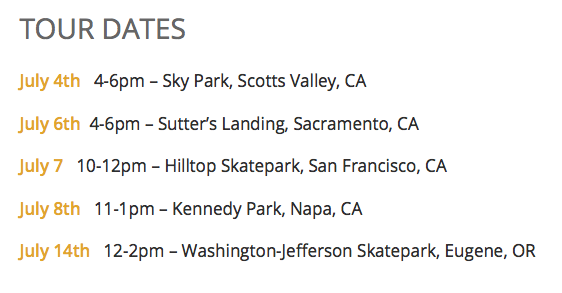 The world is more stylish with handholding & encouragement so I hope to see you at a Skate Rising event. 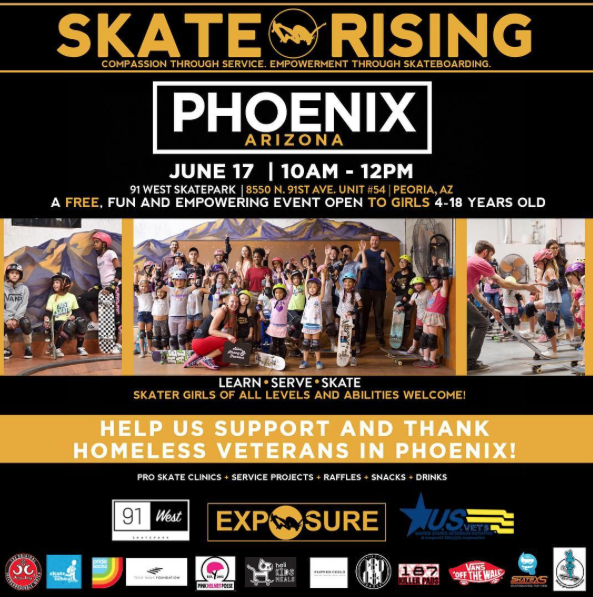 If you’re in the Phoenix Arizona area you can also check out Skate Rising Phoenix. 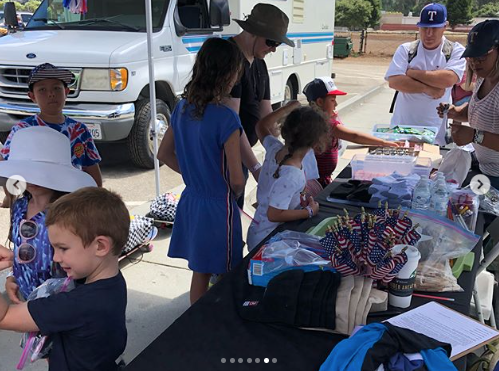 They have an event the 3rd Saturday of each month. 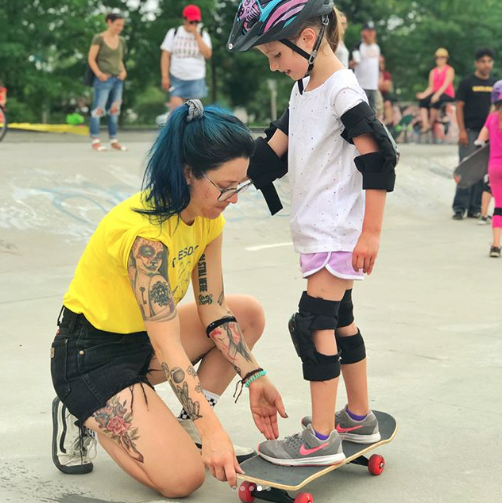 Till next time keep it stylish on & off the board and if you’re ready to share your skateboarding story & encouragement for other girls just let me know!